As the former Pacific Fleet Commander for the US Navy, Admiral Scott Swift has spent many years evaluating the United States’ strategy with China. In his view, the US has more in common with China than we have in competition, and competition is not always a bad thing. What does concern him is the erosion of the rules-based global order. Swift defines this global order as a set of rules established at multiple international conferences following WWII, and the institutions created to defend and update those rules, such as international courts. Swift points to the Scarborough Shoal Standoff as an example of China defying the rules-based global order. In 2012, China and the Philippines got into a dispute over the rights to the Scarborough Shoal, a chain of reefs in the South China Sea. The dispute landed in an international court, which sided with the Philippines. However, China refused to recognize the court’s authority. Swift says China’s defiance sets a dangerous precedent. 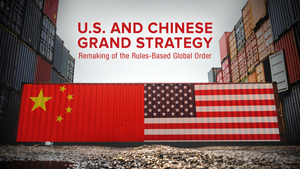 As China continues to take its place on the global stage, Swift says one key to maintaining the global order is for the Unites States to develop a grand strategy. He says the key is starting with a broad vision of ourselves and our place in the world. Swift suggests taking inspiration from documents like the Constitution, the Bill of Rights, and the Declaration of Independence and using language as broad as “we hold these truths to be self-evident.” From there, we can develop regional strategies, and ultimately policy to implement those strategies. But, Swift says before we do that, we have to fix the way we currently do things.